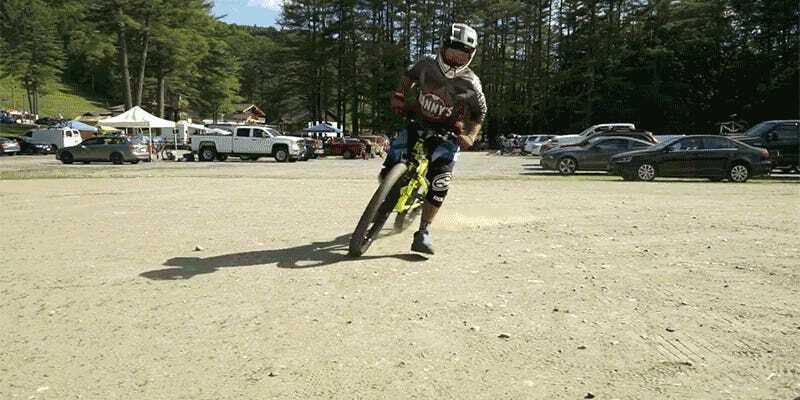 Just because this Huffy Carnage is sold by Walmart as a mountain bike doesn’t necessarily mean it can handle a legit downhill mountain run, as Phil Kmetz discovered after spending $180 on one. Halfway through his ride the bike’s brake pads were almost completely gone, and after the first jump its handlebars broke and bent. To Phil’s surprise, despite a lack of brakes, shock absorbers leaking oil, and the bike nearly falling apart, the Huffy Carnage actually delivered him (mostly) safely to the end of the downhill trail. Does he recommend it for extreme biking adventures? Not a chance, but for the price he did limp away impressed.